NASA scientists have been using telescopes on Earth to study auroras that appear at the poles of Jupiter. The scientists say that the auroras seen at the poles of the planet are heating the atmosphere to a greater depth than previously believed. The heating is a rapid response to the solar wind according to NASA. James Sinclair from the JPL in California says that the solar wind impact on Jupiter is an “extreme example of space weather.” Sinclair also noted that the observations show the solar wind was having a deeper effect on Jupiter than was typically seen. In some areas of the Earth, particularly near the poles, an aurora can be seen that is caused by the solar wind interacting with the gasses in the upper atmosphere. The same phenomena is happening on Jupiter, but the new observations show that on Jupiter the heating caused by solar wind goes two or three times deeper into the atmosphere than it does on Earth. The heating extends into the Stratosphere of Jupiter’s atmosphere. The scientists observing Jupiter say that understanding how the constant bombardment of the sun’s solar wind impacts Jupiter helps to understand the evolution of planets and their atmospheres over time. The team discovered with its observations that within a day of the solar wind hitting Jupiter, the chemistry in the atmosphere had change and temperatures rose. 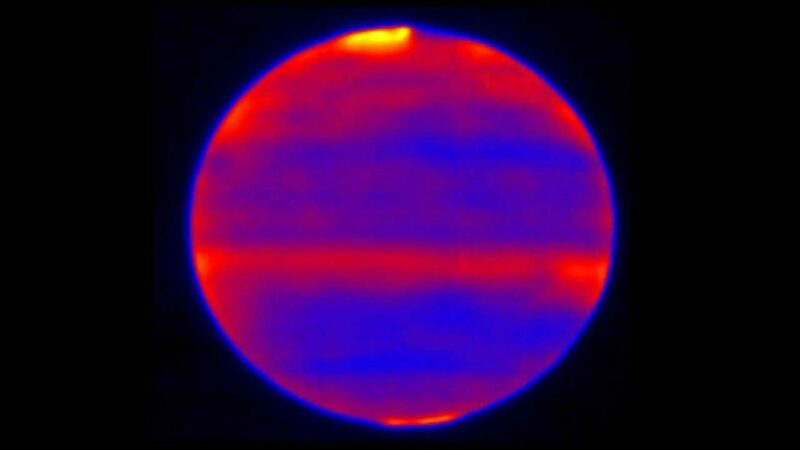 The images here are taken in infrared and show artificial colors. The yellow areas are the hottest parts of the atmosphere and are near the poles. The red areas are the next hottest spots. Observations were made using the Subaru Telescope in Hawaii and its Cooled Mid-Infrared Camera and Spectrograph (COMICS) instrument. The team hopes that the heating and chemical reactions they are observing will help them learn about other planets with harsh environments.